Creative types have relied upon Facebook‘s free brand pages to spread their word for a long time. Remember how easy it was to get fans to like your photography page, and to get strangers to share a photo of your latest painting? That’s all over now. Posts from brand pages aren’t getting the views they once did, so they’re not getting new likes and shares. And it’s a Catch-22 for copyright-owners to post their photographs and art to Facebook, anyway, since the terms you had to agree to in order to play the Facebook game result in a loss of your image rights. This disturbing Facebook trend began late last year, and I noticed it right away on two of my brand pages. Suddenly the posts were being seen by a mere handful of fans, even though each page had more than 1,000 followers. New fans weren’t finding my pages, either. Attracting the attention of more than 14 followers with any given post was suddenly impossible, unless, of course, I wanted to pay to “boost” my post. I’d been down that rabbit hole before, and wasted money and time wallowing in there, and it’s a game best left to the Big Boys and Women who have corporate marketing budgets and fancy metrics and big data. Although its familiarity is comforting, you’ll find the results you’re getting are not (if you look at your brand page’s analytics from Facebook’s Pages app, as I began to). The Facebook route was no longer viable for my photography and fine art brand pages. So what’s a small brand to do? Quit wasting time on Facebook. Its familiarity is comforting, but the results for brands are not. Quit wasting time on Facebook. (As a brand, that is. Continue to follow the trials and tribulations of your friends’ children and cats if you must.) But if you’re in business to make art, and promotion is a thing you reluctantly squeeze in on the side, or when sales taper off, your time is much better spent where you’ll find a greater return for your efforts. Your brand’s reach on Facebook has been reduced to as few as 1-2% of your followers, unless you’re willing to pay substantially for “promoted” posts (ads). Are you an artist or photographer with about 1000 fans (beyond your mom and your little sister’s friends)? Then you’ll need to put a lot of effort into getting about 10-20 views. How much effort? Click to enlarge the infographic by HubSpot’s Dan Zarella, which appeared on the Red Website Design blog to see what works, and what doesn’t work. And learn how to be less annoying than new baby videos with Red Website’s advice, 10 Tips to Write Engaging Facebook Posts. Still not convinced? If you’re determined to put effort into your Facebook brand page, but haven’t been using its Pages app to see how your strategy is working, you can learn a bit here about the latest Changes on Facebook Business Pages. Investigate adding Google+ to your mix, and you’ll find that with a Google+ account, your links are favored in Google results. You may even be delighted, as I was, to find a sophisticated audience, sharing the best in art, photography, design and tech with an appreciation for what you share, too—and fewer cat videos. Sadly, you won’t find any one option that replaces Facebook. You’ve probably already got a Tumblr account, no doubt your photos are on Instagram, or you’re active on Pinterest. If so, you’re spending a good bit of time interacting everywhere. Are the results worthwhile? Those platforms appeal to creatives, and you may be preaching to the converted, rather than reaching an audience who’ll shop for your brand. What’s working for you? What changes are you making, now that Facebook’s making you pay to play, or will you stand with Mark? I spend time on Twitter, Medium, Google+ and right here with Pairings, my blog on Art + What Goes With It (everything). My art + photos live here. How Does Nature Inform Your Art? I completely agree. I have nothing come out of the Facebook market at all with either my embroidery shop or my blog. I rarely get any interaction at all no matter how much time is put into it. I agree.. don’t waste any time or money on that option. And now you know why! If you use Buffer, you can have your blog posts automatically post on Facebook (and elsewhere) but you don’t need to spend time there. I haven’t abandoned my Facebook pages, but I recognize they’re meaningless. Do you use Google+ and Twitter? Or anything else? I have linked WordPress to Facebook for a long time now. I rarely even look at the Facebook page unless something comes up. I do use Twitter as well and it is also linked to WordPress. Sometimes I get a nudge here and there. But really again, not much more. Interesting. 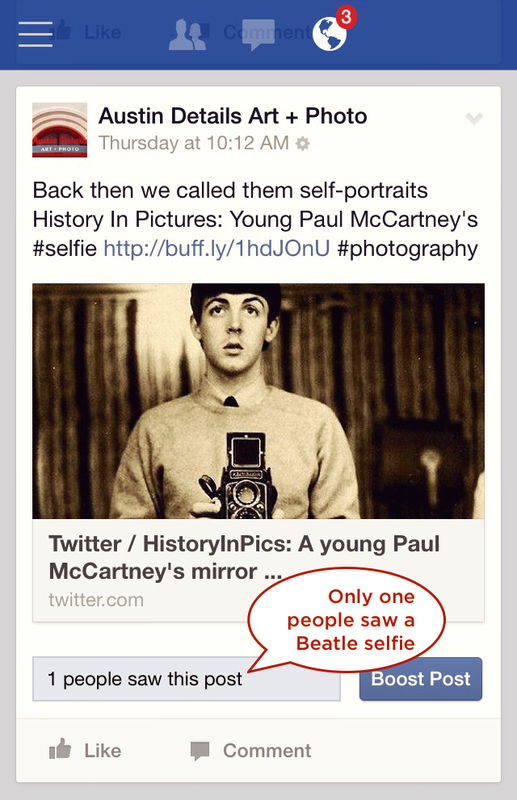 I think the takeaway is that all of the social sharing platforms are for just that–sharing. And to make nice as a sharer, you interact and share back. The rewards are still there for those who share and interact elsewhere, but not on Facebook, where your time spent interacting will go unnoticed, due to its new “Boost Post” policy. Glad to get feedback from you, thanks! I was not aware that you can lose the rights to your images on FB. I wonder if that’s also true with writing. I posted a few blog-type items in the “Notes” section of my personal FB page before starting my own WP blog. Now I’m concerned that I can’t reuse that text for other purposes. I heard about this new ‘pay-to-play’ scheme on FB from another blogger. I hadn’t really considered promoting my stuff on FB but now I definitely won’t. Thanks for your advice on this. I’m on Twitter and Google+ but still trying to figure out how to use them. Will be joining Medium soon. Hi Matthew, glad this helped out. How you “lose your rights” is Facebook’s policy of offering your posted images to advertisers to use in their promoted posts. You can use your own content anywhere you want, no worries there. But so can Facebook, regardless of your copyright, if you agree to their terms. Which you must, if you want to post there. Follow me on Twitter and Google+ and you can learn them by interacting! Let me know how you like Medium too–it’s lovely for pure writing and reading. Thanks for your feedback. I agree with your assessment of Facebook. My blogs automatically go there, which is where many of my artist friends pick them up. But, making connections with collectors? Not at all. I have Twitter, Tumblr, Google+, Pinterest, and LinkedIn accounts, but I have not figured out how to maximize those yet. I love connecting with people face to face, which is where most of my commissions arise. Nice to hear from you here, Lynn, thanks for taking the time to comment. I don’t think there’s any other trick to maximizing any platforms but this: spend time there, comment, react, share. Since our energy for that is scarce, it’s important to pick one or two that work best (and that we like best!) to put our effort in. And of course, you’re right about F2F. Good insights.